"He can make you do anything...if he puts his mind to it." 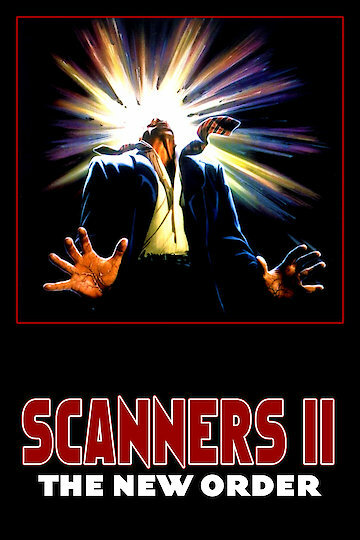 In the 1991 sequel to 1981's "Scanners," "Scanners II - The New Order" revolves around David Kellum, a veterinary student who discovers he has the ability to read and manipulate the minds of others. In the ten year span between films a highly addictive drug called Eph2 was developed to safely control the abilities of these people, or scanners as they are called in the series. David is secretly conscripted by Police Commander John Forrester to work for him after he discovers a robbery in progress and kills the perpetrator with his powers. The film reveals that Eph2 was derived from a drug called Ephemerol, developed in the 1950's to ease pregnant women's aches and pains and also caused the children to develop scanner abilities. As David gets more involved with Commander Forrester, he is partnered with another scanner named Drak to assist Commander Forrester with crime investigations. David becomes more and more entwined with the police department, he becomes involved in a conspiracy that is bigger than all of them. Scanners II: The New Order is currently available to watch free on Tubi TV and stream, download, buy on demand at Amazon Prime, Amazon, Google Play, iTunes, YouTube VOD online.